We see patients every day who are interested in their options to replace missing teeth. Some of the most common options include crowns and bridges, dentures, or dental implants. 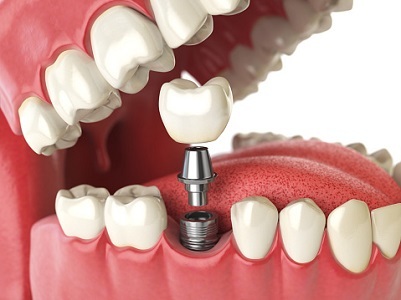 While traditional dentures were once the standard, dental implants have become more popular in recent years. The solution consists of replacements for the lost tooth roots attached to dental prosthetics. The increase in popularity is for several reasons. Implants are long lasting – Because the implant fuses with the jawbone it has strength and stability that can last for many years. Ease of use – Unlike dentures which need to be removed, cleaned, and stabilized with dental adhesive, dental implants are cared for just like natural teeth. Natural looking – The prosthetic attached to the implants can be color matched to blend in with remaining natural teeth for a beautiful smile. Strength – With implants, there is no risk of the dentures slipping out of place or falling out. Patients can trust that their strong restoration will remain in place when enjoying their favorite foods. Prior to receiving dental implants, patients will need to be evaluated to ensure the mouth is healthy enough for the restoration. Decay or gum disease will need to be addressed prior to treatment. The procedure involves placement of titanium implants into the jawbone. The number of posts depends on the number of teeth being replaced. After this is complete, a temporary restoration is placed while the gums heal and the bone attaches around the implant. Once the gums have healed, patients will return to have their permanent restorations attached to the implants. At Thirty-two dental, it’s our priority to help patients in the Powder Springs area enjoy a healthy, beautiful smile with the help of dental implants. Call today and schedule an appointment.